Henrik Ernstson takes a look at a cultural mobilization against a backdrop of contestation in one part of Cape Town. This Saturday, on September 28, 2013, Emile YX? 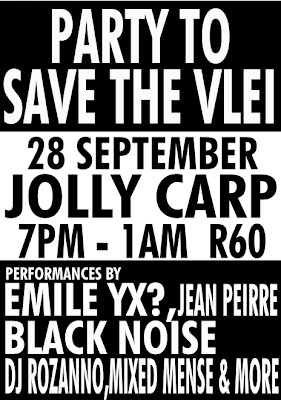 and his multiple crews of dancers and rappers will again mobilize to stop a shopping mall from being built at Princess Vlei, a park and wetland in Cape Town, South Africa. Just as they did for the first time a year ago on June 16, 2012 on Youth Day. Since their last appearance, Emile YX? and the group Mixed Mense has released a collection of songs all tuned into struggle. One soft-singing tune with hard-spoken words will most certainly be popular at the Vlei on Saturday. Some might feel that this is too harsh of a framing of Princess Vlei. Or that it is just a simple rap song, lyrics put together to gain a few rhymes. But this way of loading Princess Vlei with a content beyond plants and ‘biodiversity’, or even the matter of a shopping mall or not, has been with this mobilization since its beginning. Kelvin insists here, and others with him, often by nodding up the mountain to the Kirstenbosch Botanical Garden, that the current order of things, the dominating logic of engaging and talking about Capetonian urban nature is not addressing the “imbalance” after apartheid. The current order seems more preoccupied with activity of counting species and protecting areas already deemed as having ‘biodiversity value’. Emile YX? 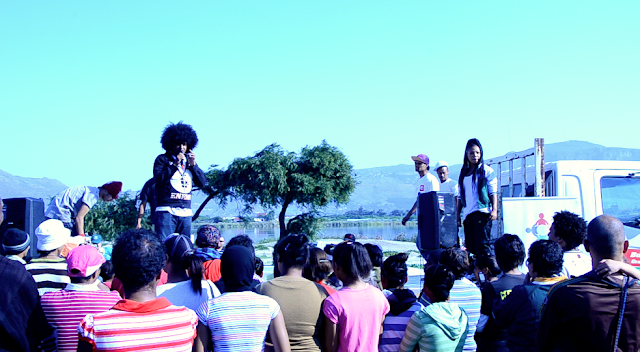 and Mixed Mense performing at Princess Vlei, Cape Town on June 16, 2012. In that sense, Bottom Road Sanctuary became a ‘blueprint’ to test if plants and fynbos could carry the voices of the marginalized and the oppressed during apartheid. Could fynbos be used to “dignify spaces”, to “correct imbalances”? Could it destabilize and rupture who could claim to be in the know of urban nature? Could it demonstrate how Capetonian urban nature is also about a history of displacement and forced removal? Could Princess Vlei be part of staging difference? Could it be made—beyond ‘bridging divides’—to tell a much broader and deeper story of a city whose geography and identities are shaped by colonialism and apartheid? These are quite troubling questions for many, but also troubling questions for many of the decision-making processes that are used to organize Cape Town and other cities in liberal democracies. Oftentimes conflicts are taken into participatory processes lead by consultancy firms who dutifully enumerate the ‘stakeholders’, note their opinions, and submit a report to the city. In this case, the report resulted in December 2011 that SPELUM, the special committee on land use, recommended that Cape Town better stop the plans to develop a mall, which the city’s councillors also supported. Of course, we know what happened—the decision shifted ‘spheres’ of governance and the Western Cape Province went ahead and supported the building of the mall in April 2012. This is where the obvious conflict is still standing. Whereas to build a mall at Princess Vlei is about politics. Something which can ‘be handled’ by participatory processes and the ‘intervention’ of the Western Cape Province. The proper political, on the other hand, are the acts that questions the given order of things and represent attempts to re-format the grammar by which we understand and perceive the city. The moment of disrupture, as Erik Swyngedouw implies, is tied to when the “police order” is exposed and challenged. This points beyond the act of giving voice, as in ‘stakeholder dialogues’ or ‘Environmental Impact Assessments‘ from liberal political theory. Rather, the political enters when the established order is disrupted and when, temporarily at least, this rupture reconfigures the order of things so as to format the sounds of the speechless into intelligible speech—to “acquire speech”. The rap song that stages a deep difference in relation to Capetonian nature, the reference to the elite spaces of Kirstenbosch Botanical Garden, and the filling of fynbos with memories of oppression at Bottom Road, are not dimensions easily handled in participatory processes, or even perhaps in a World Design Capital bid that needs to fit the clarion call to ‘bridge the divides’ of the city . Rather the staging of the proper political is about insisting that the city of Cape Town is different depending on who you are, and where you come from. The immediate hope and urge to overcome such differences might not be what Cape Town needs. But maybe what it needs are practices that stages difference, making antagonistic readings of the city clear and debatable so at to push these deep differences into the political process of the city. Here Princess Vlei plays a role in the way that such practices are being developed, expressed and longed for. For those that have the chance, head for the vlei on Saturday and think about the city and its many environments. And think about what type of political practices are needed to stage and make valid the differences across the city. Is Cape Town governable through the inherited practices of urban planning and decision-making? What else can we do? How can we live with the proper political and how can we let deep differences influence the organization of the city? Henrik Ernstson has been working with people of Grassy Park since 2007. He is a researcher and Visiting Scholar at the African Centre for Cities, University of Cape Town and is currently on leave and works at the Department of History and African Studies at Stanford University, USA. Writing in his own capacity, this is the first part of an essay on difference, people and the environment in Cape Town. For background material, see his texts and publications here (one, two, three, four, and five). He also leads various research projects and collaborations, see more at Situated Ecologies. For a longer interview with Erik Swyngedouw on the proper political, see this clip. 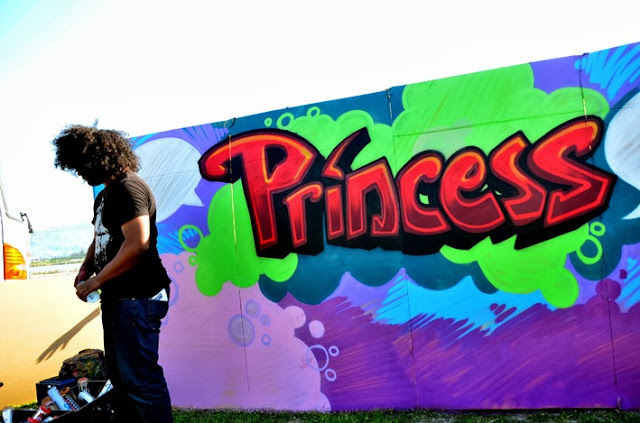 Homage to the Princess at Youth Day June 16, 2012, Princess Vlei in Cape Town. At this Youth Day, which commemorates students killed in the 1976 Soweto Uprising, the increasingly coherent campaign to Save the Princess Vlei had reached a clear point of maturation. The persons and organizations behind the Princess Vlei Forum had attracted support to resist the building of a shopping centre, and instead continue the rehabilitation of this wetland and green space towards a biodiversity rich and well-working public open space. Emile YX? and Mixed Mense warmed up the audience with young talented dancers, and earlier a priest, an imam, and a Khoi chief, had all given their blessings. Even the regional leader of South Africa’s largest labour union COSATU, Tony Ehrenreich gave a speech for saving Princess Vlei, a wetland and green area in Cape Town. This year Archbishop Desmond Tutu visited the vlei to give his support on September 2, 2013. Endnote: A very interesting process is ongoing through the Princess Vlei Forum (PVF), the campaign organization set up in 2012, and their ‘design bid’ to develop a public participation process in relation to the World Design Capital 2014 for Cape Town. While I played a part in writing a preliminary outline, journalist and writer Bridgett Pitt, with a past in the 1980s the anti-apartheid Grassroots Community Newspaper, has played a major role. It was ‘selected’ by the World Design Capital committee and has attracted professional designers and artists, including colleagues at the African Centre for Cities. However, since the whole framework of the World Design Capital is to ‘bridge the divides’ of the city, which obviously Princess Vlei could play into since it has gathered people with different languages, racial/ethnic groups, and works across the culture/nature divisions, this framing could also force the deep differences that I am writing about here off the chart of what is possible to do with such a ‘design bid’. In negotiating the wishes of the World Design Capital, deep differences needs to be negotiated and refigured into something less disruptive, something more ‘constructive’. But I might be wrong. Can we ask for subversive urban design? An urban design that aims to place among us the differences that proper political procedure needs to work with and through? That can participate in the staging of difference? If possible, it would be something akin to radical democratic design—or why not, “urban design from Cape Flats”, capeflattian design. Maybe, Princess Vlei can serve as a serious experimental ground for this—together with other spaces of Cape Flats, and similarly marginalized spaces of Cape Town. More on this in my next part of this sequel of essays.